Alain George studied at the London School of Economics and the University of Oxford, and has taught at the University of Edinburgh since 2007. In 2010, he was awarded a Philip Leverhulme Prize in recognition of his research. He is the author of The Rise of Islamic Calligraphy (2010) and of numerous articles on Qur’anic manuscripts, Arabic illustrated books and the arts in early Islam. Andrew Marsham studied at Oxford University and worked at the universities Sheffield, Cambridge and Manchester before moving to Edinburgh in 2008. He is the author of Rituals of Islamic Monarchy : Accession and Succession in the First Muslim Empire and a number of book chapters and articles on the early history and historiography of Islam and its Late Antique context. When the Umayyads, the first Islamic dynasty, rose to power shortly after the death of the Prophet Muhammad (d. 632), the polity of which they assumed control had only recently expanded out of Arabia into the Roman eastern Mediterranean, Iraq and Iran. A century later, by the time of their downfall in 750, the last Umayyad caliphs governed the largest empire that the world had seen, stretching from Spain in the West to the Indus valley and Central Asia in the East. By then, their dynasty and the ruling circles around it had articulated with increasing clarity the public face of the new monotheistic religion of Islam, created major masterpieces of world art and architecture, some of which still stand today, and built a state apparatus that was crucial to ensuring the continuity of the Islamic polity. Within the vast lands under their control, the Umayyads and their allies ruled over a mosaic of peoples, languages and faiths, first among them Christianity, Judaism and the Ancient religion of Iran, Zoroastrianism. The Umayyad period is profoundly different from ours, yet it also resonates with modern concerns, from the origins of Islam to dynamics of cultural exchange. Editors Alain George and Andrew Marsham bring together a collection of essays that shed new light on this crucial period. 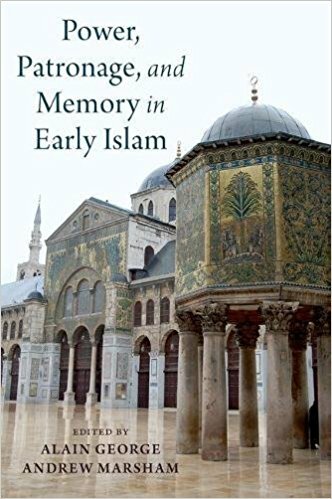 Power, Patronage, and Memory in Early Islam elucidates the ways in which Umayyad élites fashioned and projected their self-image, and how these articulations, in turn, mirrored their own times. The authors, combining perspectives from different disciplines, present new material evidence, introduce fresh perspectives about key themes and monuments, and revisit the nature of the historical writing that shaped our knowledge of this period.